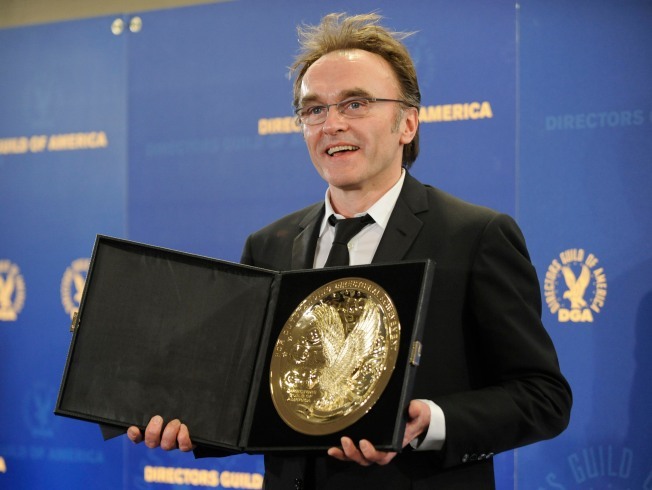 "Slumdog Millionaire" Director Danny Boyle poses with his award backstage at the Directors Guild of America Awards on Saturday, Jan. 31, 2009, in Los Angeles. While "Slumdog Millionaire" started as an underdog that nearly went straight to DVD, it has emerged as the Oscar favorite. Audiences have embraced Boyle's tale of a poor boy rising to fame and fortune from the streets of Mumbai, and the film triumphed at the Golden Globes and Producers Guild of America Awards, while taking the prize for best ensemble cast from the Screen Actors Guild. "I should start by curiously thanking Warner Bros. for actually having the grace to do the right thing, when I think it would have been a lot easier to do the wrong thing, and pass the film on to Fox Searchlight, who are an extraordinary bunch of people," Boyle said as he was introduced earlier in the night as one of the five nominees. Ari Folman's "Waltz With Bashir" won the documentary award. The film, which is nominated in the foreign-language category at the Academy Awards, is director Folman's animated study of an Israeli soldier struggling to recall suppressed memories of his involvement in the war with Lebanon. "The motion picture is the art form I love above all others," Ebert said in a statement recorded via a synthetic computer voice with a British accent. "It is the symphony, and you are the conductors." — Reality programming: Tony Croll, "America's Next Top Model." — Children's programs: Amy Schatz, "The Poetry Show." — Daytime serials: Larry Carpenter, "One Life to Live."